Several years ago I started a nonprofit organization called Changing Oasis, Inc. My vision and purpose were to help women who were in need of empowerment, guidance, and coaching. This was a big quest because, here in the inner city of Chicago, so many women feel like they don’t need anything except a pair of shoes, some cute lipstick, and eyelashes to be successful. But I knew they needed much more than that. This became glaringly clear once I hired my first coach. You see, when I started my Changing Oasis, my life had taken a downward turn. At that time I found myself being a displaced math teacher from the Chicago Public School system. Even with my credentials of more than 15 years of experience, a master’s degree in leadership, and a license to become a principal, I was still let go. At the time I felt hurt and discouraged. But instead of letting that get me down, I decided to embrace it as a life lesson and use the situation as a bridge to help me get over to the right side of success. I also decided to use every lesson that I had ever taught my students to help myself and build my business. I can remember telling them that failure is not an option. In the same way I would push them to be the best, I began to push myself. It was at that point I decided that I needed to rebuild not only my self-image, but also my spiritual being. So I took the money that I had often allocated as “my shoe money” and hired a coach. My coach taught me to focus on my inner strength and clean out old baggage, including my family. Now several years later, I’m looking better, feeling better, and even publishing my own books, and created joint ventures to partner with other inspiring authors that are looking to build their brand and increase their bottom line. I have my own online coaching and social media consulting company called Better Destination Media, Inc. Social Media Boutique—both in addition to my nonprofit, Changing Oasis, Inc. I learned from my second coach and after taking several courses in finance that it’s never good to put all your eggs in one basket. With my several businesses, I’ve definitely seen an increase in my bottom line. While coaching played one big role in that increase, networking definitely helped take it to the next level. Always keep your head shot and bio close by. You might be called upon at any time to talk on a panel or to be interviewed about your business. Also make sure you have written two to three press releases. This will help you when someone has to introduce you and they don't have a lot of time to research all that you do. If you have a network, be sure to promote and send your head shot to their website so that if someone wants to find out more you and your business, your image and name will pop up in the Google web imagine search. Find ways to become a speaker or expert in your field, and capitalize on every appearance. Make sure your website is designed in a way that accurately represents your brand. If you are using a free website, you will be very limited. If you are using WordPress to build your community, there will be fees associated with it. If you want to get out there with little or no money, try Wix or Ning and create your fan page to match these initial designs. Keep your fan page updated and linked to your website. Your web presence and what you are writing is key to your communication with the world. Create a professional business profile on LinkedIn and update it weekly using the FLIPboard app. This is one place you will love especially if you are a building all of your networks in one place. The one key thing that's really cool is that you can post any pictures from any of your social networks and build a magazine based on your ideas. You will be ready to take on mobile marketing because you will be able to use this app on your phone, iPad, and any technology that will let you upload the app. As my social networks helped me build my bottom line, I must advise you on the importance of using them to also build yours. It is critical that you plan your schedule and time your posts of your work on social media. What I've found by using the FLIPboard app is that I am able to do everything in one place and it saves me time and energy. Plus I don't feel like I am getting lost in the social media realm. In everything that you do, always remember your WHY. Your why is going to be your driving force. It will be that thing that keeps you going and growing, so don't take for granted the importance of knowing what your why story is. Take some time to develop it and keep it close to you at all times. You will need it on those days that you feel like you want to quit. Once I knew what I wanted to do, I decided to arm myself with my principles, and I jumped into immediate action. I did several things to accomplish my goals. First, I joined the B.O.S.S. (Bringing Out Successful Sisters) network here in Chicago. Being a part of this network has enabled me to join a network of professional businesswomen and be featured as a businesswoman. I have also had the opportunity to expand my network and build with the women in the Chicago-land area. Just like with the Diva Millionaire's Club powered by the Network for Women in Business, I’m able to post, blog, add pictures, and promote my events. 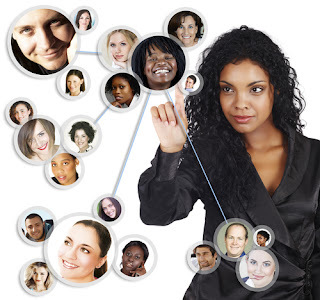 You are building your network around like-minded women. Second, I started an online radio show for Changing Oasis, Inc., with Intellectual Radio and Blog Talk Radio. We wanted to create buzz and help build on the foundation of leadership, networking, community, and sisterhood. This form of media presence and networking allowed us to interview businessmen and businesswomen all across the United States, which also gave me the opportunity to learn from other entrepreneurs and connect outside of my usual circle of friends. I have been able to build partnerships in Los Angeles, Atlanta, Houston, and Florida. Having an online radio show has helped us build our brand without having a large advertising budget, which is why I encourage everyone to use these tools to grow their business. Last but not least, I developed a larger social media presence by creating a fan page for my not-for-profit business on Facebook and being on book tours speaking. As a result of creating this page, many of my fans are able to see more content and communicate socially with our brand. This is something that only took a few months to build. We did ours using pay-per-click and sponsored stories, paying a company to grow the number of our likes. In the process, I learned that you should tag your fan page whenever you are posting in groups and in your personal news feed. This helps build awareness, and you can run a contest and get people to come support your business. All of this has helped us to increase our network as well as increase my bottom line. You can build yours too if you follow these techniques. This is exactly what I needed! Thank you! !